Welcome to the Heart of Minneapolis! On Tuesday, January 2, I had the honor and privilege to be sworn into office as the City Council Member for Minneapolis Ward 3! I look forward to faithfully serving everyone in this ward and across the city for the next four years. I have been assigned to the following Council committees: Ways & Means (Vice Chair), Budget (Vice Chair), Public Safety & Emergency Management (Vice Chair), Economic Development & Regulatory Services, Transportation & Public Works, and Enterprise. As a member of these committees, I will be able to have a direct impact on affordable housing, public safety, transportation options, and supporting small businesses. I look forward to my work on those and other priorities as we move forward. I was able to recruit two outstanding staff to join me in my office: Senior Policy Aide David Zaffrann can be reached at David.Zaffrann@MinneapolisMN.gov or 612-673-3142, and Policy Associate Laura Dorle can be reached at Laura.Dorle@MinneapolisMN.gov or 612-673-3126. We will send periodic newsletters like this one by email, and I also encourage you to Like our Facebook Page and follow me on Twitter to get up-to-date information about issues, events, and more in Ward 3 and around Minneapolis. In case you haven’t heard, the Super Bowl will be held at U.S. Bank Stadium on Sunday, February 4! Whether you’re a football fan or not, this is a huge event and a huge opportunity for all of us to show off our City to the country and the world, and hopefully have some fun, too. Two areas in Ward 3 downtown will have road closures: U.S. Bank Stadium for the game itself and Nicollet Avenue for Super Bowl LIVE. On Super Bowl Sunday, Feb. 4, SOME municipal parking facilities will require total use for event purposes, i.e. no contract parking will be available. There will be no change for monthly contract parking in municipal facilities until game day. The Commons park will also be affected. The East Block of The Commons will be closed to the public from January 6 - February 9, 2018. The West Block of The Commons will remain open and accessible for public use from January 6 - February 9, 2018. There will be no public restrooms available at The Commons until Feb 12. Regular light-rail service WILL NOT operate on Sunday, February 4. Only those holding an official Super Bowl LII ticket, along with a Gameday Fan Express Pass, will be allowed to go through security checkpoints and board trains at either Mall of America (Blue Line) or Stadium Village (Green Line) stations. Green Line service will operate normally between Stadium Village and Union Depot stations. Toward the end of the last city council term, an ordinance began moving through the committee process that would have loosened restrictions on billboards in downtown Minneapolis. Because my office has received a high volume of constituent contact on this proposal, I wanted to share an update on its status. In short: it is dead. Any ordinance that was not passed before the end of the four-year council term is automatically ‘returned to author’ and would need to be reintroduced to become active again in the new term. Council Member Warsame, the ordinance’s original author, has expressed to me that he does not intend to reintroduce the ordinance. I join the near-unanimous voice of my Ward 3 neighbors in opposing the ordinance and will not reintroduce it. I have appreciated the constituent feedback on this ordinance, and appreciate Council Member Warsame’s willingness to incorporate the feedback from Ward 3 constituents into his thinking on the topic. In the process of researching this ordinance, many of us learned that the current law already allows more new billboards than most of us realized or would like to see since much of Ward 3 is in an ‘opportunity zone’ for billboards that was designated decades ago, before the rise in residential land use in many of our neighborhoods. My office will explore whether this zoning policy should be revisited to further restrict billboards in downtown areas with residential land use. Since taking office and even before, I have been working with residents and businesses in the Sheridan neighborhood who will be impacted by the construction project at 14th Ave and Marshall Ave throughout much of this year. Builders will install a crane in the last week of January that will not leave room on 14th for two lanes of traffic plus parking. We’ve identified a temporary change — making 14th Ave one-way eastbound between Marshall and Grand — that will help make the corner of 14th and Marshall safer while visibility is blocked by construction equipment and reduce the parking impact on local businesses nearby, including The Draft Horse and the Food Building. We've heard from those small business owners that this temporary change will help their businesses thrive. Before we moved forward with a decision, we worked to reach everyone else who would be most impacted. My staff and I knocked on doors within a couple of blocks of the construction site to get community input, and got almost entirely positive feedback. We checked with the fire department and the Sheridan Neighborhood Organization, who ended up writing a letter of support for the change. Our goal was to come up with a solution that supports our small businesses, keeps drivers and pedestrians safe, and inconveniences as few people as possible. There's no perfect answer, but I'm confident that we found the best possible answer together for our neighborhood. Thanks to everyone who shared their opinions! Anytime a shooting occurs in any neighborhood, it's a trauma – to the victims, to the witnesses, and to everyone whose sense of peace and safety is disrupted with the sound of gunfire. On January 6, that trauma came to Dinkytown. I want to express my profound condolences to the family and friends of the victim who died, my wishes for healing to the victim who was injured, and offer the support of my office to anyone in the neighborhood with questions, concerns, or ideas about how to help everyone in our community be and feel safe. I spoke with Inspector Loining from the 2nd Precinct the following morning to get an update and to express my thanks to the investigators who are working in response to this tragedy on behalf of the city. I can share that we have no reason to interpret this as anything other than an isolated incident. On January 10, I had the opportunity to welcome legislators from across the state to Ward 3 during a State Senate bonding tour, to make the case for state investment in the Lock & Dam as a destination visitor's center and public park space on the Mississippi River in the heart of Minneapolis. We also got to tour the City’s Emergency Operations Training Facility and the Upper Harbor Terminal, where we have a chance to make a huge, impactful investment in riverfront access on the Northside. With both the Lock & Dam and the Upper Harbor Terminal, we want to make the Mississippi River as open and accessible and beautiful and fun a place to be for everyone that we possibly can. I want to thank all of the state legislators who joined us and the City’s Inter-Governmental Relations staff who coordinated the whole tour. We didn’t see all of those priorities in the Governor’s bonding proposal, but I’m hopeful the legislators who saw the potential for a revitalized Mississippi River will focus some investment on our cherished natural resource. One thing that is included in Governor Dayton’s proposal that you may have heard about is funding for needed repairs to the Stone Arch Bridge. Obviously, ensuring the Stone Arch Bridge remains safe and open to the public is a top priority for Ward 3 and the entire city, and I’m working with my colleagues on the Inter-Governmental Relations committee to provide additional city support for MN DOT’s request for funding to maintain our iconic bridge. The City of Minneapolis has settled its first case of retaliation under the sick and safe time ordinance, resulting in an $11,000 settlement for the employee. A gas station that strongly discouraged its employees from using sick leave – even though it allowed it on paper – triggered a report of violation from an employee who had become ill and unavailable to work. When he requested sick leave he was denied and then banned from the premises and removed from the schedule. He effectively lost his job. As a low-wage worker, he depends on his current paycheck to pay rent. Following the employer’s actions in this case, he was evicted from his apartment and now lives with family members. He did not want to return to this employer. In just over three months from the date the employee filed the complaint, the Minneapolis Department of Civil Rights reached a settlement agreement for $11,000 in lost wages for him and will monitor compliance going forward with the gas station. Civil Rights staff will also conduct in-person trainings there separately for employees and management. People who work in Minneapolis whose employers don’t provide the sick and safe time required by the new law can call 311 or visit www.minneapolismn.gov/sicktimeinfo to ask a question or file a complaint with the Labor Standards Enforcement Division of the Minneapolis Department of Civil Rights. For healthy workers, healthy businesses and healthy communities, the new ordinance protecting time off for people who get sick and work in Minneapolis took effect July 1. Employers with six or more workers are required to provide time off at a minimum threshold of at least one hour of paid sick time for every 30 hours worked. Employers with five or fewer workers must also provide sick time, but it may be unpaid. The goal of the ordinance is to protect public health and prevent workers from being penalized because of illness or a need to care for a sick loved one. More information about the ordinance is at www.minneapolismn.gov/sicktimeinfo. The City’s new municipal minimum wage ordinance has taken effect. For this first phase of the ordinance, large businesses with more than 100 employees will be required to pay workers at least $10 an hour. The tiered phase-in period for small and large businesses is as follows. 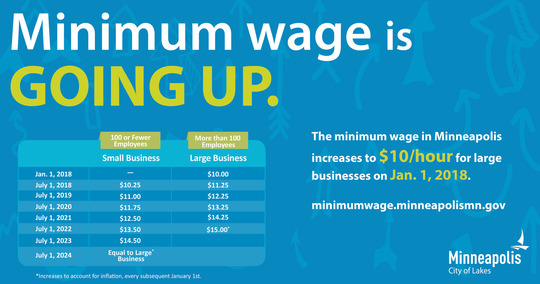 Note: The minimum wage will be indexed to inflation every subsequent January after the $15 an hour wage is reached. The City’s Department of Civil Rights will oversee enforcement of the municipal minimum wage, and employees are encouraged to report violations online. More than 84,000 people in Minneapolis have incomes below the federal poverty level. An increase in the minimum wage to $15 an hour would benefit 23 percent of workers in Minneapolis – about 71,000 people. Of this number a majority are low-wage workers of color. The City of Minneapolis youth employment program STEP-UP has begun accepting applications for 2018 summer internship placements. Eligible Minneapolis youths ages 14-21 who are interested in participating in the 2018 STEP-UP class have until Feb. 16 to complete an application online. STEP-UP is one of the country’s premier youth employment programs, serving Minneapolis youths who face some of the greatest barriers to employment. Since the program was launched, it has provided more than 27,000 internship opportunities. Businesses, public agencies and nonprofits interested in employing interns in 2018 can find information on the City of Minneapolis STEP-UP website. The City of Minneapolis is in the process of updating our Comprehensive Plan, which outlines our citywide policies and priorities and will guide our work to grow equitably and sustainably toward a unified vision for Minneapolis in 2040. Sign up now for the seventh annual Community Connections Conference at the Minneapolis Convention Center Saturday, Feb. 10. The Community Connections Conference is a free event with exciting speakers, exhibitors and learning labs, including topics ranging from immigration to tenant rights. The conference will also feature a Minneapolis neighborhood showcase and delicious food from American Indian, African American and Southeast Asian caterers among others. Come join nonprofits, elected leaders, community organizations and others to learn about civic engagement opportunities, community partnerships, social justice initiatives and ways to shape local government policies. Sign up here. The East of the River Park Master Plan will create cohesive long-term plans for 36 Minneapolis park properties east of the Mississippi River. The project launched last fall. Since then, Minneapolis Parks staff have hosted three official Community Advisory Committee (CAC) meetings, visited more than 30 different community events and worked with a Youth Design Team to begin developing the plan. Over the next month, work will be focused on taking in-depth looks at parks within individual neighborhoods. Check out the list below, mark your calendar, show up and make a difference in creating a long-term vision that will guide how your favorite neighborhood parks evolve. Please also take a few minutes to provide input on all the neighborhood parks in NE and SE Minneapolis through our online survey linked below. The fourth East of the River Park Master Plan Community Advisory Committee (CAC) meeting has been scheduled. All CAC meetings are open to the public! Visit the project page to view recaps of the three previous CAC meetings. There’s an online survey available for people who may not have the time to attend one of these design sessions. Please take a few minutes to reflect on and share your experiences in NE/SE Minneapolis parks. Survey responses will be accepted until Wednesday, Feb. 28, 2018. East of the River Park Master Plan Survey.